The Rose Bowl may not be what you’d expect this year – after, all the historic game won’t feature a team from the Pac-12 or the Big Ten, the traditional invitees. In their stead, the Rose Bowl will host its second College Football Playoff Semifinal since 2015, this time with No. 2 Georgia going against No. 3 Oklahoma. And tradition be damned – prices for Rose Bowl Tickets for this game are already through the roof. As of D ec. 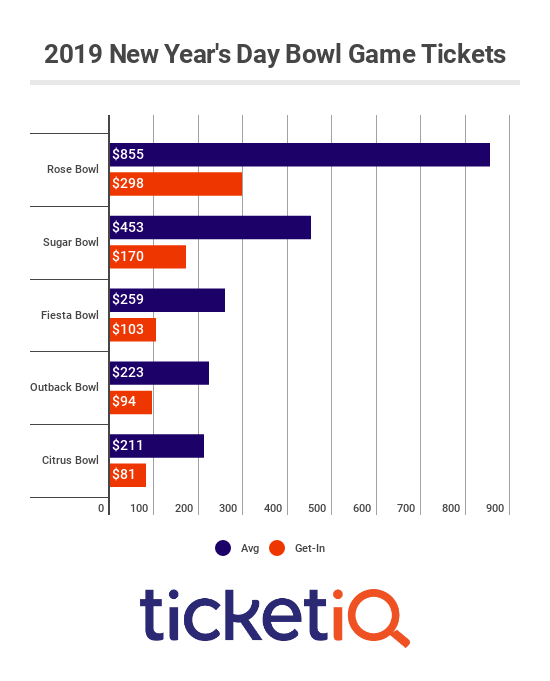 4, the average asking price for Rose Bowl tickets on TicketIQ.com was $668 – nearly double the $341 that got fans into the 2015 Oregon-Florida State game. That price, though, isn’t as steep as the average asking price for the Sugar Bowl semifinal, which pits No. 1 Clemson against No. 4 Alabama. But prices for both of these games are well above the average price for a national semifinal in the CFP era. This year’s Rose Bowl asking price currently ranks third in the eight years during which TicketIQ.com has tracked prices. 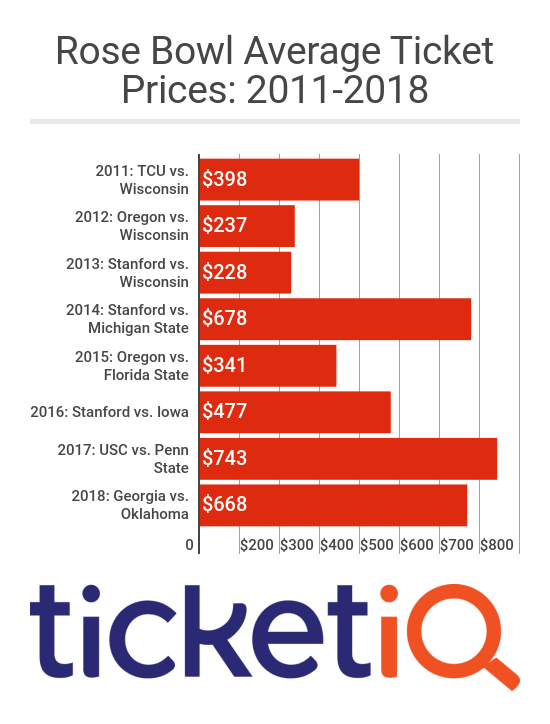 Georgia, who won the national championship 1980, are making their first College Football Playoffs, and Georgia Rose Bowl tickets are far and away the most expensive Bulldog bowl tickets in the eight years TicketIq.com has tracked prices. This is the Sooners' second trip to the college football playoffs, and were selected national champions once during the Bowl Championship Series era (2000) and six times previously. Tickets for the Rose Bowl are the highest in the last eight years for an Oklahoma bowl game, with the 2013 Cotton Bowl vs. Texas A&M the second most expensive at $421. And while tickets for the game are among the highest for a CFP semifinal, they’re not yet in the stratosphere of last year’s pSC-Penn State Rose Bowl, which ran $743 per ticket. If money is no object, you could spring for a 50-yardline seat, but if it is, check out TicketIQ’s Low-Price Guarantee listings, where end-zone tickets in section 12H ($249), 13L ($254) and 11L ($264) are all available.